Checker Block - Are you as smitten? The good part is that it's super easy and not at all fussy, so should take you no time at all. I've broken down the cutting and piecing instructions into the diagrams below, which can also be downloaded as a one-page PDF. 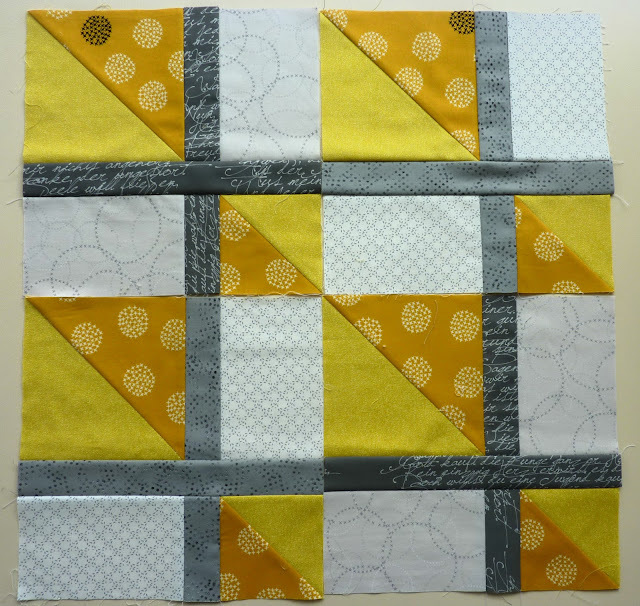 You can also find a tutorial for this block on the Blossom Hearts blog. I've been coveting a yellow-grey quilt for a while, and these gorgeous fat-eighth bundles that I treated myself to for my birthday this year were the perfect starting point. 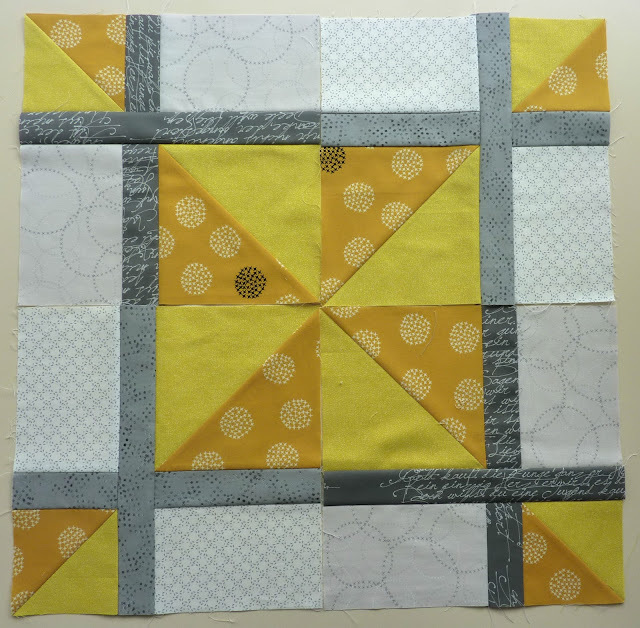 For the HSTs, please use a dark yellow and light yellow; the difference in shade should be noticeable. The large and small HSTs don't have to be made of the same fabrics, so if you want to raid your scrap bins, by all means do (Who doesn't love a good scrap*? I know I do! ), but try to keep the colours of the large HST and the small HST similar. If you can avoid using yellows that feature colours other than white, yellow, grey, or black, that would make me an extra-happy bunny, but don't go buying fabric just to satisfy my whims—I'll be a happy bunny either way. For the larger grey blocks, please use a light grey. The two pieces can be of different fabrics, but try to keep them similar so they don't draw the eye away from the centre of the block. 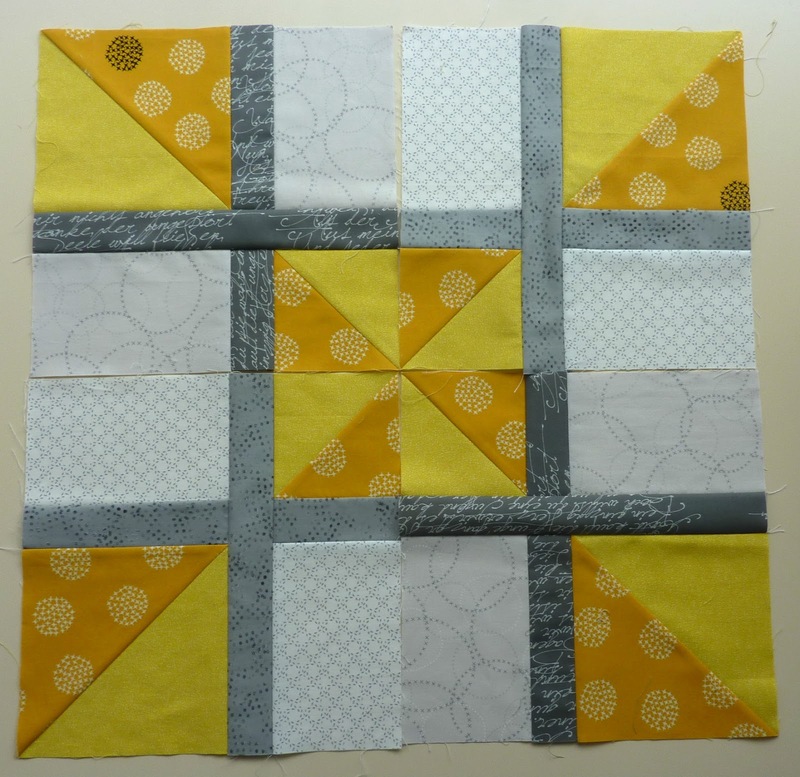 For the HSTs, place the squares right sides together and draw a diagonal line from corner to corner. 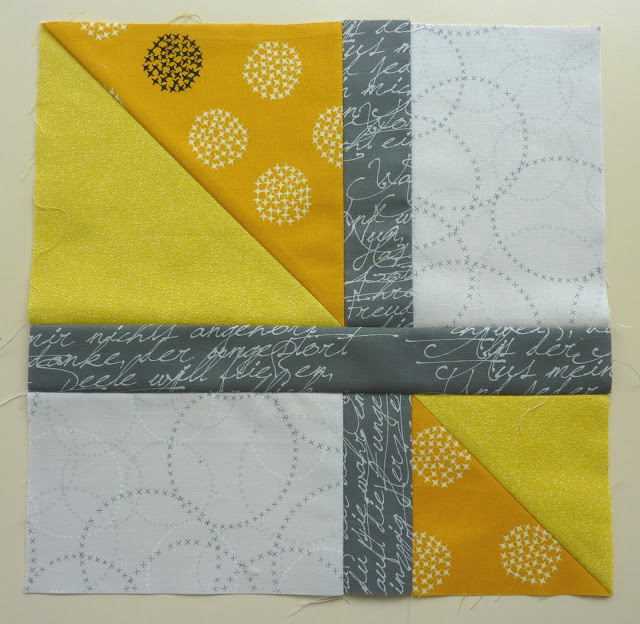 Sew a 1/4" on either side of the line and then cut along the drawn line. Press the seams open and trim the HSTs to 4.5" and 7", respectively. This will give you two sets of HSTs for each size – please just send the extras along with your finished block so I can make more blocks with them, or if you feel inclined to make a second block—they're so fast and easy—I'm not going to say no ;). Follow the diagram below to put the block together, paying attention to the direction of the HSTs. The dark/light sides should be on opposite sides of the block diagonal, in the order shown (that is, for the large HST, the darker value will be on top, and for the small HST, the darker value will be on the bottom--does that make sense?). Press seams open. I know that shipping to Europe is expensive, so feel free to fold up this sucker to fit in a standard envelope. I'll press (yeah right. I'll iron) it into submission on my end. Please don't include any extras*--save your money to buy more fabric! I can't wait to see what you come up with—feel free to tag me on Instagram (@quiltingrainbows) with your progress shots or finished block, or drop me an email if you have any questions. * Except, in case you're looking to get rid of some small scraps, I'm planning an EPIC quilt for QuiltCon made up of about eleventy squillion 2.5" squares. If you feel like throwing a scrap or two my way, I'd be incredibly grateful. Goodness, I'm in love with this block! This is going to make a STUNNING quilt! I know, Audrey! It was like Cupid's arrow straight to the heart when I saw it! I saw this one too, and almost went for it! I love yellow and grey too! I'm psyched for this block. Hive 5 - August Seaside Treasure!! Hive 6 block for Jennifer. August block bound for Deutschland! Hive 5 August Improve block for MJ.